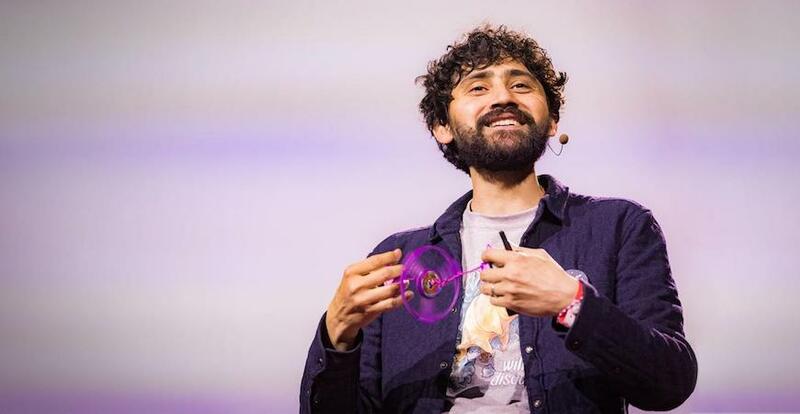 Manu Prakash demonstrates the Paperfuge at an April 2017 TED talk. On Sept. 22, MacArthur "Genius" Award winner and Stanford University bioengineering Professor Manu Prakash will deliver the keynote lecture at the first annual open house for UC Merced’s Center for Cellular and Biomolecular Machines (CCBM), a National Science Foundation Center of Research Excellence in Science and Technology (NSF-CREST). 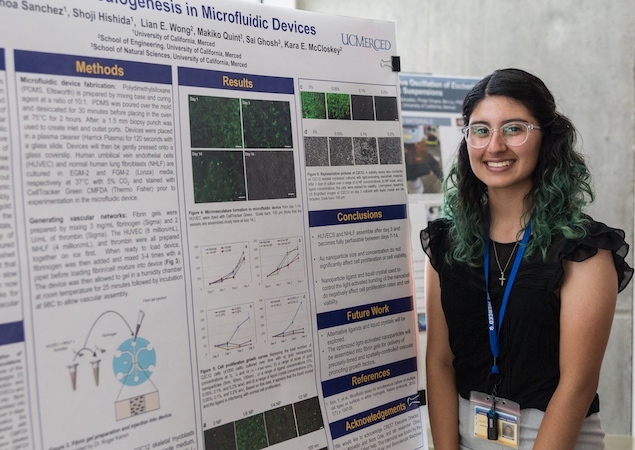 The daylong open house will include a variety of events and activities related to biophysics, biochemistry and bioengineering, in addition to Prakash’s keynote. Prakash is a renowned scientist and inventor famous for developing scientific tools from inexpensive, easy-to-obtain materials. His inventions have the potential to revolutionize medicine, diagnostics and basic science by making scientific instruments available to resource-poor regions of the world. The Foldscope, perhaps his most famous invention, is a fully functional microscope made from 50-cents of paper. Users simply fold a paper stencil to produce a microscope powerful enough to visualize disease-causing microbes. Prakash is also inventor of the Paperfuge, a hand-powered, lightweight, paper centrifuge that costs 20 cents to make and is capable of producing G-forces in excess of 30,000 G’s. Compare that with astronauts, who experience about 3 G’s during takeoff, or fighter pilots, who occasionally peak at 9 G’s during their most intense maneuvering. Essential to medical diagnostic labs, centrifuges spin fluids at super-high speeds to separate them into their constituent parts, which can then be analyzed to diagnose a wide array of diseases. More than just a brilliant inventor, Prakash is also a gifted lecturer and science communicator. He’s delivered TED Talks viewed and shared millions of times (talks can be found here and here), and he’s bringing his rhetorical gifts to UC Merced. Prakash will deliver a keynote lecture titled "Curiosity, Frugal Science and Global Health: Opportunities and Challenges.” The talk will be held at 12:45 p.m. in the Classroom & Office Building 1, Room 120. But the keynote isn’t the day’s only highlight. CCBM Summer Internship Program student presenting original research at a poster presentation earlier this year. “The open house will highlight CCBM research, education and community outreach efforts that showcase the center’s mission,” said CCBM Executive Director Carrie Kouadio. The CCBM uses an interdisciplinary approach combining physical, biological and engineering methods to understand and control the functioning of multi-scale assemblies of biomolecules and cells, and to design and develop novel bio-inspired functioning machines ranging from designer cells and tissue to diagnostic and therapeutic devices. The center is also focused on enhancing biophysics, biochemistry, and bioengineering graduate and undergraduate education, as well as leading K-12 STEM outreach activities in the Merced area for teachers and students. The open house begins with tours of CCBM-affiliated labs and a poster session in which CCBM graduate students will present original research. Following the keynote, attendees can participate in hands-on STEM demonstrations, including activities involving the Foldscope and other educational STEM activities. This will be followed by more lab tours and an afternoon poster session showcasing the research efforts of undergraduate CREST Scholars and CCBM Summer Internship Program (C-SIP) participants alongside local high school students and teachers who participated in CCBM’s summer Science and Technology Enrichment Program (STEP). The day culminates with an awards ceremony for poster presenters and a reception. The CCBM open house is free and open to the public. Space is limited, so attendees are encouraged to pre-register online. Guest parking is available in Lake Lot 2. Please note that meters accept only credit cards. Click here to view the event flier and complete schedule of events. For information, contact CCBM Programs Manager Nora M. Cole at ncole2@ucmerced.edu or 209-228-3603.